In earlier chapters, the discussions have focused on setting standards, determining the status of regional air quality, determining the sources of a problem, and finally developing a plan to solve or at least address the regional air quality problem. Air quality is only improved if appropriate emissions are actually reduced. It is easy for an air quality management program to get lost in the identification of problems and the potential solutions with little thought or commitment put into the actual emission reductions that must come out of the program. The organization and approach for an implementation program for the air quality plan is a critical part of the overall air quality management process. Without the proper organization and approach to implementation, little actual emission reductions will be accomplished. It is obvious that no organization can work without properly trained employees who are both motivated and empowered. Entire books can be and have been written relating to the issues of identifying and then managing the appropriate employees for an organization. However, this section does not address the personnel aspects of the program even though there is a great need in many locations for better trained and motivated environmental professionals. The reader should look to quality management texts to investigate this aspect of program implementation. Instead, our purpose is to focus on the general organizational aspects of the program. Once an air quality plan is produced, two steps must be taken. First, the rules and initiatives called for in the air quality management plan must be developed and promulgated along with specific plans to accomplish expected initiatives. Second, the rules once developed and promulgated must be enforced; or in the case of an initiative put into place. The enforcement system must allow for adequate communication between air quality planners, regulation development staff, and enforcers and the communication should be bi-directional, not just one way. That is to say that the planners need to talk to and listen to those enforcing and writing regulations. Regulation development staff must communicate with enforcers and planners, and enforcers must communicate with planners and regulation development staff about enforcement problems they encounter. In addition, this must be done in an atmosphere of mutual respect. No single person’s duties supersede those of another person. While some of these thoughts might seem obvious, it is notable how often there is a lack of significant communication between the various enforcement sections in an air quality management program and care must be taken to foster this communication. The enforcement organization chosen must also allow for a balanced approach to the various environmental issues. It is easy for air quality issues or water quality issues to become the predominant interest and to leave the other environmental issues with less or little emphasis. While this can sometimes be a political issue, this balance needs to be accounted for in the development and application of an air quality enforcement program. The United States has tended to take a separate path in the organization of its air quality programs compared to Europe and South America. The United States tends to organize around media. That is, it tends to set up a separate program directed to air quality, another program directed to water quality, and a program directed to solid waste. These programs are, for the most part, totally self contained. Thus, an air quality management program will have a planning unit, an air monitoring unit, a legal unit, and an enforcement unit. 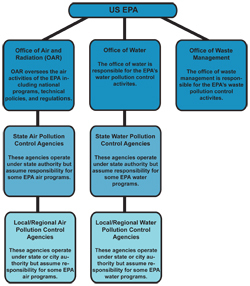 An overview of the United States environmental management program is shown in figure 3.7.1-1. Europe and South America have tended to organize more by function or activity. That is to say that there might be a planning unit that addresses air quality, water quality, and solid waste. Then there might be an enforcement unit that enforces regulations related to air quality, water quality, and solid waste. Finally, there might be a monitoring unit that covers air, water and waste. These various units may be in totally different departments of government. 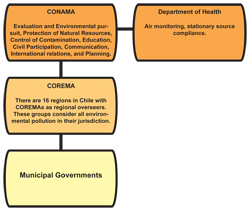 For example in Chile, there is a totally independent air quality planning agency, CONAMA (Corporación Nacional del Medio Ambiente), but the development of regulations and enforcement of air, water, and solid waste rules is housed within the health department. A separate air, water, waste monitoring unit is located in a different part of the health department. 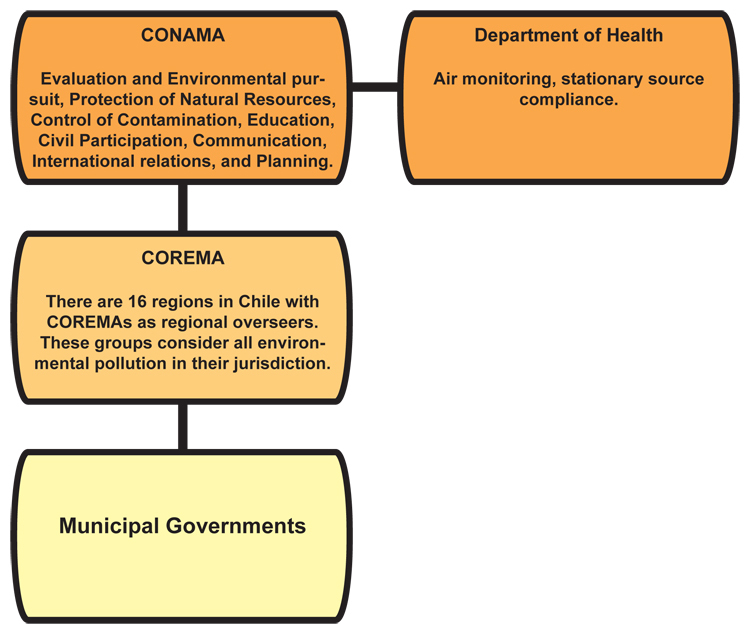 Figure 3.7.1-2 provides an overview of the Chile air quality management process. As noted earlier, there have been successful applications of both organizational approaches. We have noted Chile as one of the more successful air quality management programs and they have tended toward the organization by function approach. England also tends to organize by function rather than media. The state of Arizona in the United States moved away from the organization by media approach to adopt the organization by function approach used more in Europe and South America. The organization by function allows expertise to develop over a wide range of media and theoretically should help provide a fair balance among enforcement actions toward different media. The drawback of the organization by function is the lack of communication that can occur between the planners and the enforcers and the inability for the planning agencies to get changes in enforcement or monitoring priorities. 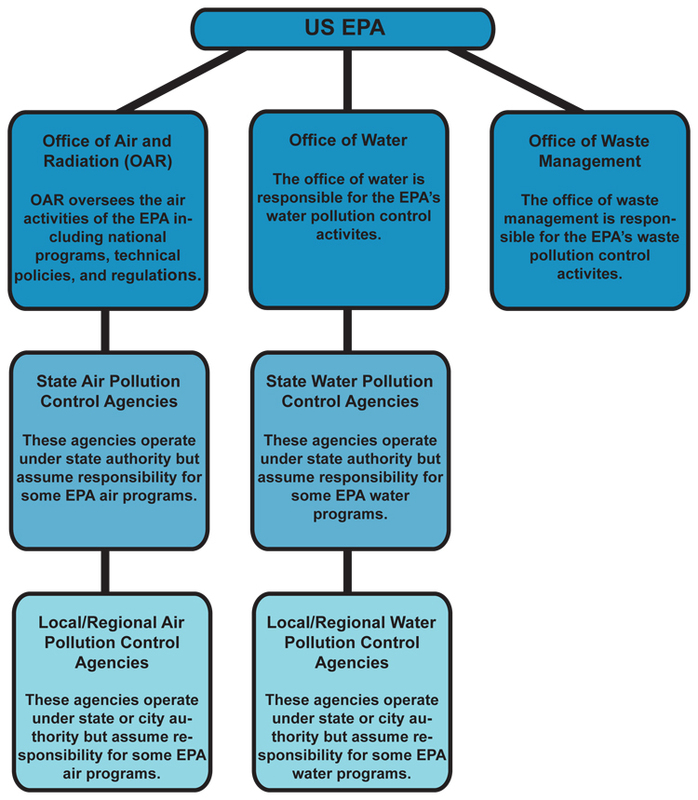 Most programs in the United States consider the Arizona organization by function model to be less successful than the organization by media used by the other states and the United States Environmental Protection Agency. Staff at CONAMA, the planning agency in Chile, complains that the enforcement units and monitoring units give low priority to the air quality issues when compared to other issues. Recent audits of the Chile air pollution control program have argued for a closer relationship between the monitoring, enforcement, and planning programs. Organization by media allows for a much more integrated air quality management program since the planning, monitoring, regulation development, and regulation enforcement operate with a single mandate (i.e. to clean up the air). Communication between the various function are easier to maintain in this case. Programs organized in this manner have proved to be highly successful in many cases. The major draw back with this organization is that programs can become isolated from issues associated with other media and conflicts can occur. An important example has been the conflict between air quality agencies and water quality in the case where water agencies want to spray contaminated water into the air to remove water contaminants creating air quality problems or the cases were air agencies wanted the removal of sulfur from fuel and increased the potential for waste disposal problems. Arrangements need to be made in the case of organization by media to ensure communications between administrators and planners from the various agencies. Regardless of the organizational approach, care must be given to provide adequate communication between the various organizational functions and to balance priorities with respect to funding, fairness, and enforcement. The approach taken toward the stakeholders in the air quality management organization is an important consideration in improving air quality. In an ideal world, everyone works together to achieve the best outcome for the community. In reality, business is preoccupied with making money, the public considers the narrow view of their immediate interests, and government can become indifferent or overly bureaucratic. As with their organizational structures, the United States and Europe tend to take different approaches in their enforcement activities. The United States tends to adopt a very open but more adversarial approach to its enforcement programs. In Europe, companies seem to be more willing to voluntarily reduce emissions and many rules and enforcement actions are negotiated. Both approaches have their advantages, and it is difficult to determine which approach might be more successful than the other in the long run. The industry, being regulated along with societal norms, has a lot to do with the type of approach that can or should be used. If a negotiation type of approach is determined to be the best approach then great care must be taken to keep the process open. This refers back to the transparency issues discussed in earlier. Negotiated rules and enforcement actions can look like or become “backroom” deals to the public if not handled carefully. Again the nature of the whole governmental process and societal norms come into play in establishing a regions approach to enforcement activities. An adversarial approach does ensure that the regulated industry is pushed harder compared to the negotiation approach. It may be that an adversarial approach is the only workable way to move the air quality improvement agenda forward in the case of some locations or some sectors of the business community. This is especially true in the case of severe air quality problems where major control efforts must be undertaken. A subject closely related to the general approach to be taken is the balance between protecting the environment and protecting the economy. Industry and economic development offices often see primarily the economic impact of environmental decisions while regulatory and environmental community can focus only on the high cost of the health and welfare impacts of air pollution. Clearly, both must be considered in developing the proper air quality management approach. The time frame allowed for compliance is one tool that is often used to allow the economy to go through the necessary changes as the environment is improved. Also, as discussed in the next section, the evaluation of the cost effectiveness of rules is a second important consideration. The bottom line is that environmental compliance is achieved through an integrated planning, regulatory development, and compliance enforcement system. If programs are organized by media then care must be taken to encourage back and forth communication between the programs addressing the various media. If programs are organized by function, then systems must be established to ensure transparency, communication and effective exchanges among the various functions and proper balance is given to achieving compliance with respect to the various media. Ultimately, the approach taken to achieve compliance will significantly impact the outcome of the program! The approach to the most effective compliance system is dependant upon societal norms and can range from negotiation to adversarial processes.